From its taut rectangular opening riff, a delirious organ suddenly escapes like a rabbit from a trap, and we’re immersed in a swirling hypnodelic soup. The sound is fresh and yet strangely familiar, the melody whimsical, capricious, pulling in a multitude of directions. 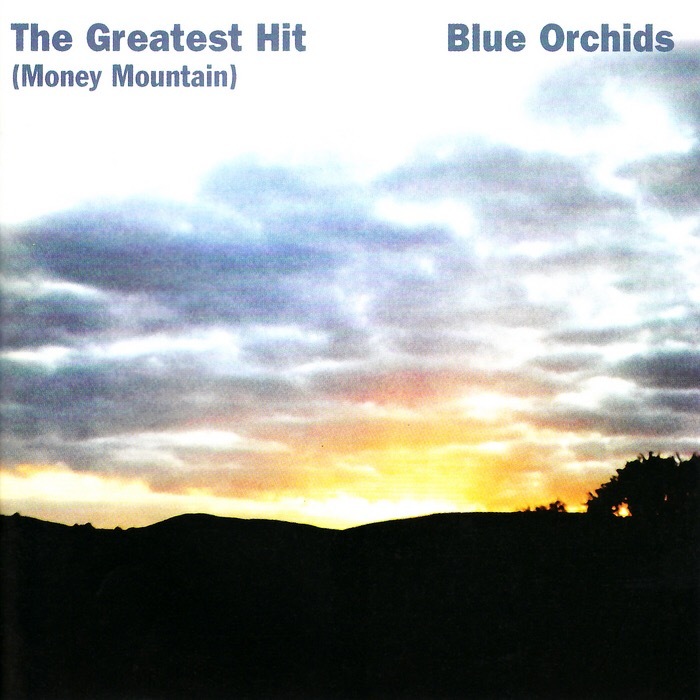 When my needle first dropped on ‘Sun Connection’, the opening track of The Blue Orchids’ debut album, The Greatest Hit (Money Mountain), I instantly succumbed to its spell. Martin Bramah had waited patiently for this moment. As founding members of The Fall, he and Una Baines had watched as MES tightened an iron grip he would never relinquish. Una had been first to depart. When Martin joined her in early ’79, it felt like something of an artistic liberation. Bramah would briefly reunite with Smith & co. in 1989, leaving after the rather splendid Extricate album. But after his first exit a decade earlier, the overwhelming feeling was one of relief: he now had the freedom to indulge his creative capacities in something which would manifest itself in the purest form of self-expression – music made by its makers, for its makers, “for the love and glory of it” as Bramah attests. His new project had originally been baptised The Blessed Orchids by Manc’s favourite punk-poet John Cooper Clarke. The band released two 45s on Rough Trade before producing one of post-punk’s greatest – and unfairly overlooked – albums. It was a chaotic period, but one Bramah remembers with great fondness. Into the intoxicating mix were slung liberal portions of the Krautrock rhythms of Can and Neu! and illusive hints of The Velvets, Syd Barrett and The Doors, but if truth be told, it was difficult to neatly pin down the broad spectrum of influences at work. The guitars on ‘A Year With No Head’ are brilliant, at first possessing the wiry rhythmic algebra of Talking Heads, before they tiptoe gingerly across constellations of stars recalling the somnolent intricacies of Tom Verlaine’s quieter moments. ‘Hanging Man’ takes the TH similarity a step further, pillaging the riff and the über neurosis from ‘Psycho Killer’ along its topsyturvy trajectory. On the seething speed-fuelled pulse of ‘Dumb Magician’, it sounds like Michael Karoli’s guitar is lassoing the rings of Saturn, while ‘Tighten My Belt’ is a curious slice of dub-inflected No Wave funk which sounds like it’s migrated here from the Ottoman Empire. Musically this was a far more radical era. There was much more risk-taking and adventurousness, and space where this kind of bizarre melange sounded de rigeur. As for influence, well how much UK indie music from the mid to late 80s was lifted from ‘Bad Education’ and ‘No Looking Back’? The latter is superb – like several other tracks here it sounds about 20 years ahead of its time, outflanking Interpol and The Strokes in as much the same way as the guitar at the finale briefly threatens to outpace its own feedback. The album closes with ‘Mad As The Mist And Snow’ which conjures a similarly portentous olde folke aura as ‘Space Odyssey’ – the closer on The Byrds’ Notorious Byrd Bros classic. It may feel like an incongruous finale, but adds an even denser layer of mystery to proceedings. It sounds almost as if the band existed in their own little bubble, oblivious to the ’82 zeitgeist. Comparisons with contemporaries such as The Teardrop Explodes, Swell Maps and The Soft Boys persist, perhaps because those bands had a similar genius for harnessing the energy of punk and marrying that to a looser (consciously or subconsciously retro) psychedelic approach. Relations between punk’s primal itch and psychedelia’s improvisational aesthetic were in the hands of Bramah & company, unusually cordial. On reflection, was your first departure from The Fall more an artistic liberation than a cruel setback? • Yes, you could call it an artistic liberation – I had proved myself as a composer/arranger in The Fall and I wanted the freedom to play with words too. I have never thought of my departure as a cruel setback – I’ve always done things my own way in my own time. I left because I’d had enough of the situation at Fall HQ: Mark begged me to stay but I was determined to jump ship. It had been an intense two years and things were getting claustrophobic – plus Mark took it upon himself to decide what I had and hadn’t written without consulting me. You really can’t trust the writing credits on Fall albums – everything ex-members say is true in that regard. > I think I read once that you had said those two Fall spells were distinguished by the shifting power dynamic – and that your second spell was characterised by an employer/employee relationship with Mark whereas in the beginning you had just been friends. Do you think when Una and yourself left in ’79, that marked the end of democracy and the beginning of Mark’s totalitarian leadership? • First of all, Una left The Fall in December ’77, not long after Tony Friel – I mention this because people tend to forget Yvonne Pawlett’s great contribution to the band in ’78/’79. The ‘totalitarian’ thing had been there from the start; it’s in Mark’s nature. At first it was Una who helped Mark hold the upper hand, as they were the only couple in the band and the ‘universe of two’ as they liked to refer to themselves. Then when they began to drift apart in the fall of ’77 Mark brought Kay Carroll in as his new manager/live-in-lover. Kay’s arrival was the real reason for the original band members leaving one by one because she always fought Mark’s corner and encouraged him to think of himself as a lone genius. > What do you recall about the recording sessions for the album? Did you have much of a budget? Was it yourself or Tony Roberts who engineered/oversaw the final mix? • Recording ‘The Greatest Hit’ was a blast from start to finish: a drug driven couple of weeks (mainly speed, weed n poppers at that point) in a converted warehouse on Blossom St. in Ancoats, Manchester. It was Tony Robert’s eight-track studio (he’d had the honour of playing drums on the classic ‘Gordon Is A Moron’ by Jilted John). Geoff Travis at Rough Trade figured Blue Orchids needed the good old-fashioned restriction of an eight-track tape machine, so we booked Tony’s place. We didn’t have much of a budget really, but Geoff did hire the guy who had just produced ‘Ghost Town’ for The Specials to produce our album – well this producer (I forget his name) sat there for the first week, appalled at our antics and contributed very little. We finished all the recording in the first week and our Rough Trade paid for producer took the tapes home with him to do some rough mixes (he was famous in Birmingham for his ‘Lovers Rock’ mixes). When we heard the results we were not happy and so we went back into Tony’s place to mix the album ourselves, which took up the second week. Tony Roberts engineered the recording and I oversaw the final mix. > I’m hearing the pulsing Krautrock rhythms of Can and Neu! and even Michael Karoli’s guitar landscapes on ‘Dumb Magician’. Elsewhere, traces of The Velvets, Syd Barrett here and there, and The Doors. What else do you remember listening to around that time? • I love Michael Karoli’s guitar playing, he’s definitely in my top ten guitarists list. I was listening to all the above-mentioned artists of course – plus maybe Donovan, Richard Hell, Iggy Pop, The Modern Lovers and The Kinks. > On ‘Sun Connection’ as well as elsewhere, the sound is warm and infectious. I’ve heard Una’s playing come in for a bit of criticism, as if she was using a different music sheet, but I love the way the instruments move away from one another to create this loose swirling hypnotic sound. Was there a bit of freedom to improvise there, or were the individual parts written that way? • Sun Connection is a fusion of three musical ideas into one concept piece. I wrote all the guitar and bass parts with quite a rigid arrangement from start to finish. But with the keyboards I just told Una what key the various sections were in, and let her improvise, so the keyboards seem to flow through a structure, like light through stained glass. I think it works really well and no criticism has ever reached my ears. > As a document, how far is The Greatest Hit the missing link between the frenetic post-punk of The Fall, Wire & Swell Maps and the jangling indie guitar sound of Felt and The Weather Prophets, which looked back to ’67 as much as to ’77? • I am not qualified to answer this question, as I was not trying to be the missing link between anything. My main intention was to create something ‘in the now’ something modern but quite plain in a way. I was trying to drop all the baggage of rock cliché and say ‘Here I stand today – a young man in the city – this is how I feel – this is what I think – this is my spirituality – these are my aims.’ and so on. It is for others to decide where the album fits into the scheme of things. > Was the album title a drug reference or a commentary on capitalist greed – it was recorded just as the impact of Thatcherism was leading to strife in the inner cities – as otherwise the lyrics don’t strike me as political, more personal. Who/what were the major influences on your lyric writing? • The title of the album played on both those ideas, obviously, that’s what made it interesting, but it was taken from a line in Sun Connection: ‘Think I’ll go out, buy myself a soul – the greatest hit in the world.’ So getting a soul is the ultimate hit! Also there were so many ‘greatest hits’ albums out there in every bargain bin that I thought it would be funny to use ‘The Greatest Hit’ singular as it had never been done – again it appealed to my sense of the title being something plain. As to the major influences on my writing, that’s hard to say as I pull the germs of ideas from all over the place; books, movies, folk music, but as far as rock writing goes I was very influenced in my early efforts by the ideas that Bowie and Eno laid out in the late ’70s, like a lot of other young budding writers from that era. Ideas of deconstruction and abstraction, fragmentation and getting the essence of things – but I always put my own original spin on the things I write – I have studied the content, but I don’t imitate the style. > The Greatest Hit sounds incredibly fresh today, almost as if the band existed in a bubble, insulating yourselves from the ’81/’82 zeitgeist. It sold pretty well. Are you frustrated that at the time, you didn’t really build on that momentum? • Frustrated? No. Momentum can be a dangerous thing for an artist who wants to stay in control of the creative process – momentum means commercial pressures come into play that most artists find hard to combat – the daily drip, drip of sound business advice from those with a stake in your success. Momentum and Hype, I always run a mile when I see them coming! I make the music I want to make when I want to make it and I trust in it to work its way into the world by a kind of osmosis. I have never made music to make a living. I am that rare breed: The Great British Amateur – always much better than the professional because we do it for the love and glory of it. But to answer your question: Yes, I suppose life did throw a couple of spanners into the works which stopped us conquering the world in the mid-eighties. > How did the partnership with Nico come about? Where ultimately did it lead you? • I was a teenage Nico fan. I had all her records. The last thing I ever expected was that she would turn up in Manchester – why would she? But one day she did. It turned out Nico was staying at this cheap hotel in Whalley Range and she was looking for some musicians to back her. So we drove over there and I was ushered into her presence like she was some kind of guru cult leader. We talked about what I don’t remember but it must have gone well because we agreed to work togetheron her upcoming live shows, which I was obviously thrilled about. That led to a busy year of touring the UK and Europe acting as her backing band and support act, doing two sets a night. I learned a lot during my time with Nico for which I’ll always be grateful. However, the time came when I felt it we should draw a line under our work with Nico – we had our first album out and I didn’t want to become branded as being just her backing band. The trouble was that our rhythm section had slipped into heroin addiction, due to its availability around the Nicocrowd, and so they wanted to stay put on the gravy train. This led to a split in the band, with our manager, bass player, drummer and crew all carrying on touring with Nico and her ‘Blue Orchids’ – while I put together a new line-up but lost some of the ‘momentum’ we had gathered up to that point. > You’ve been making records to a smallish but loyal fan base ever since. What would you say have been the main developments in your music between the first album and The Once And Future Thing? • No developments – every recording is different from the last – but has me at the core reacting to the times I’m in – making my ‘in the now’ statements with ‘style and flair’ as everything changes around me but stays the same! I have fun making records and I try and go deep into myself and the music but always putting the listener first – that is, always keeping the ‘layman’s ear’ (an idea I coined in the early Fall). > The Awefull compilation gathers together the Rough Trade singles – and hopefully will open up your music to a new audience. You’ve been gigging too – notice any younger faces in the crowd?